Samsung made a solid tablet, but it isn't perfect — and at this price you almost expect it to be. The Galaxy Tab S2 8.0 is thin, light, powerful, has a great screen, and is sprinkled with extra features like a fingerprint sensor, good battery life, a decent rear-facing camera and a solid side-by-side app implementation. Unfortunately it still comes up short with Samsung's overall weak software design, and poor button and speaker placement when using the tablet in landscape. Perhaps the biggest downside, however, is it's price — not everyone is willing to spend $399 on an 8-inch tablet. High-end Android tablets hardly have the market or mind share that Apple's iPad line does, but you can still count on Samsung to release a couple solid tablet offerings every year. Though I'm not too convinced they sell very well in the grand scheme of the tablet market, as far as higher-end Android offerings go Samsung has a good chunk of the sales — and for good reason, they're often the best choices if you're looking to spend a bit extra on a tablet. The latest offering is the Galaxy Tab S2, coming in both 8-inch and 9.7-inch sizes, as a follow-up to the nicely-received Galaxy Tab S series. Just like its previous iterations, Samsung is focusing on a few key points that really sell tablets — light weight, a great screen and solid performance for gaming and media consumption. At the same time Samsung can leverage its absolutely massive customer base of people who are familiar with its TouchWiz software customizations to sell tablets that won't require any extra learning after they get it home. All of the boxes are checked here on the Galaxy Tab S2, with few compromises. But does that mean it's worth the premium price it commands while the Android tablet market goes cheaper and cheaper? That's what we're here to explain — read on for our full Galaxy Tab S2 8.0 review. I (Andrew Martonik) am writing this review after two weeks using a black 32GB Wi-Fi model of the Galaxy Tab S2 8.0. The software build on the tablet was LMY47X.T710XXU2BOJ1 (the latest software), and wasn't updated during the course of the review. Samsung also offers a 9.7-inch version of the Galaxy Tab S2, with the same design and specs but a larger screen and battery. Unless otherwise noted, this review is mostly applicable to both tablets. Though it was released in the summer of 2015 and only shown off finally at the Galaxy Note 5 launch, the Galaxy Tab S2 8.0 actually shares a resemblance to Samsung's devices of late last year — the Galaxy Note 4 and Galaxy Alpha. Just like those devices, there's a metal frame that runs through the tablet and is exposed around the edges, with a light powder coating on it matching the color of the rest of the device that's nicely chamfered on the top edges. The contrast between the shiny edges and matte color is most pronounced on the black model (which I have here), but is noticeable on the white and gold models as well. It feels a bit cheaper than the fully-exposed metal frame on the Galaxy S6 and Note 5, but is still cold to the touch and nice to grip nonetheless. Aside from the bits of metal exposed around the edges, the rest of the device is either plastic (on the back) or glass (on the front). The entire back plate is a slightly-soft panel of plastic, which feels solid — thanks to the fact that it isn't removable — and provides just the right amount of grip without also collecting tons of fingerprints. There are two little spring-loaded holes that are used for attaching accessory covers and keyboards (never understood why Samsung doesn't use magnets instead), and a small but noticeable camera pod up at the top when held in portrait. It all adds up to a very generic "tablet" shape and design, which is just fine for me. Despite being rather angular on the sides, super thin and completely flat on the back, the extreme lightness of the Tab S2 8.0 — 265 g, or just over half a pound — makes the Tab S2 super easy to hold, even in one hand. The bezels aren't as super-thin as the ones on Samsung's modern phones, and on a tablet we're happy about that — you need somewhere to grip this thing. The top bezel is plenty large, but unfortunately Samsung is sticking with its standard physical home button and two capacitive keys on the bottom bezel, making it tough to hold the tablet in landscape without activating them. The placements of the buttons, keys and logos on the Tab S2 8.0 clearly point to this being a portrait-first device, but a tablet is used in landscape far more often than a phone and when you rotate it the navigation buttons are a real hinderance to your usage. On-screen navigation buttons would've made far more sense here, even at the cost of losing a fingerprint sensor that's embedded in the home button. Interestingly, Samsung dropped these physical navigation buttons from its gargantuan Galaxy View tablet, even though that's a landscape-only device. Samsung really knows displays, and the Tab S2 8.0 keeps the bar high just like its predecessors have. While I wouldn't put it on the same level as the Galaxy Note 5 (which makes sense considering the price), the 8-inch 2048x1536 SuperAMOLED panel is really good. It gets plenty bright, and importantly for a tablet you're likely to read on it also gets dim without dropping color accuracy or quality. As you may notice by those resolution numbers the Tab S2 8.0 has a 4:3 screen aspect ratio, which comes off as being a bit closer to square than many other tablets that are in a 16:10 or 16:9 aspect ratio. Tablets as a whole are moving toward this aspect ratio (see: iPads, Nexus 9, Pixel C, ZenPad S 8.0, etc. ), which is far better for reading, browsing, gaming and navigating, but of course gives you black bars above and below widescreen media content. Watching a movie or TV show and having bars on the top and bottom of the picture is a bit annoying, but that problem is somewhat mitigated by the super deep blacks the AMOLED screen offers. I think most people will be spending more time doing things that fill up the full 4:3 display to make it worth it. And while it isn't as important on a smaller device like this, the 4:3 aspect ratio also helps keep the tablet from feeling too tall when held in portrait mode — a big plus for general navigation and comfort holding the tablet. If you've used any Samsung phone or tablet released in the last two years, you'll feel right at home on the Tab S2 8.0. We're working with Android 5.1.1 and Samsung's TouchWiz customizations, which haven't changed much since the move to Lollipop and a general slimming down of the number of bells, whistles and features. What you get here precisely mirrors the Galaxy Note 5, save for a few tablet-related interface tweaks in the settings. Because of its small size and portrait-first design, the launcher home screens and app drawer aren't really changed from the phone interface either, which I'm generally okay with on a smaller tablet. The stock launcher is in a 6x5 configuration for your apps and widgets, and unlike the phones there's no way to change the grid size — you'll have to go to a third-party launcher for that. The display density is set so that you get a good amount of information on any given screen, with proper tablet-optimized apps looking nice in both portrait and landscape. You of course get Samsung's main set of customizations, with a configurable set of quick settings toggles in the notification shade, the Flipboard-powered "Briefing" interface on the leftmost home screen, side-by-side Multi Window apps and Samsung's usual suite of in-house apps. Microsoft's Word, PowerPoint, OneNote and OneDrive are pre-loaded as well, which doesn't make as much sense on the 8-inch model as it does on the 9.7-inch that has an optional keyboard cover accessory. Performance-wise the software is extremely fast, right on par with the latest Samsung phones despite the Tab S2 8.0 having a lower-power processor — the Exynos 5430 versus the 7420 found in the Note 5. It's still a quick octa-core chip and it's backed up by 3GB of RAM, meaning you won't have any issues with basic or complex tasks. Outside of a single issue with Wi-Fi connectivity dropping I never had a drop in performance on the Tab S2, which is a great sign. Most people don't really put tablets — especially smaller models — through too many demanding tasks, but even if you need to crank it up and do some multitasking or heavy gaming the Tab S2 is up for it. Getting to know the Galaxy Tab S2 8.0 is pretty simple — just like every other mid-sized tablet, you use it just like a really big phone, in this case it's just a big Galaxy S6. The story of Android apps not being tablet-ready has been told numerous times, and it's the same situation all over again here on the Tab S2. Plenty of apps — like those from Samsung and some of Google's — that you open up on the tablet will fill the screen with a dense view of information that takes advantage of the size, but a majority won't ... they'll just look like a phone app. Now on a portrait-oriented 8-inch tablet that ends up not being too big of an issue, and in that respect the Tab S2 gets a bit of a pass, but on the larger 9.7-inch version it starts to be more noticeable and frustrating. Now of course this isn't anything Samsung has control over — all it can do is what it's done, which is make its own apps fill the screen properly, and keep making good tablets to hopefully encourage app developers to make their apps scale better to the larger screen. In fact, having a larger screen to work with points out one of Samsung's biggest strengths — hundreds of great apps support its Multi Window function to run phone-sized side-by-side apps when holding the Tab S2 8.0 in landscape mode. Not every app supports this function, but more than you'd expect do and being able to work with two different apps at the same time is great even on this smaller tablet screen. When it comes to battery life, the Tab S2 8.0 actually doesn't offer that big of a cell under its plastic back. You get just 4000 mAh, which is on the small side for a device of this size but helps achieve that amazingly light weight. Samsung quotes 10 hours of "Internet use" (whatever that means) out of the Tab S2 8.0, and broadening that out to just 10 hours of general screen-on use I found it to be generally true. As is the case with everyone else I don't stare at my tablet for hours and hours on end, I use it for 15 or 30 minutes at a time — save for when I'm watching a movie — and it sits on a table the rest of the time. Because it doesn't pack Marshmallow's great Doze feature to help standby usage it does drain notably when the screen's off, but importantly it doesn't drain heavily with the screen on either. For example, streaming an HD video from Google Play Movies drops the Tab S2 8.0's battery at a rate of five percent every half hour, meaning you could watch five hours straight of video and only use half of a full battery charge. The same went for my usual morning streaming sessions of English Premier League matches using the NBC Sports Live Extra app, where I could watch a full match (nearly two hours) and only watch the battery meter drop a handful of percentage points. It's important that a tablet can handle this sort of usage smoothly, and the Tab S2 8.0 definitely does. When I set the tablet back down, it dropped maybe a percentage point or two before I picked it up again later in the day. Interestingly Samsung doesn't include its Adaptive Fast Charging (that'd be Quick Charge) on the tablet, which would have been a nice feature to have — even though the battery isn't very big for an 8-inch tablet, it's still large and takes plenty of time to charge up. The only thing really going for it here is that you aren't likely to be charging the tablet but every few of days when using it casually, and it has plenty of life to last you a full day of use including multiple hours of video playback. I've talked multiple times here about the Tab S2 8.0's portrait orientation and how it comes back to bite you when you use it in landscape mode, but one of the biggest areas this is notable is with the speaker. There are two speaker grilles on the bottom of the Tab S2 8.0 (when holding in portrait orientation), meaning that you can get a weak form of stereo when holding the tablet that way (they're only a couple inches apart) but get a completely lopsided audio experience when holding the tablet in landscape. Considering that you're most likely to want good speakers on your tablet when holding it in landscape instead of portrait, such as for video or playing a game, it's unfortunate to have the speakers on only one side. Clearly there are size constraints at play here with the thin 5.6 mm frame, but if there was any way to get true stereo speakers in here when holding it in landscape mode that would've been great. The 8-inch screen may not offer the most immersive experience compared to a larger tablet, but its portable size and light weight really make it great for traveling with the watch video, and it comes up short because of the speaker placement. Beyond just the placement issues the speakers just aren't that loud, which again is unsurprising considering the thinness and weight of the tablet. With all of the high-end features and components on offer in the Tab S2, the speaker is the one really disappointing aspect of it. You're probably best off plugging a pair of good headphones into the tablet if you're going to sit down for anything longer than a 10-minute YouTube video. An 8-inch tablet is right on the borderline of what I'd personally deem acceptable to be taking pictures with out in the world, but if you must hold up this big slab to snap a photo of a nice scene on the street it will hopefully turn out well. The 8MP camera on the back of the Tab S2 8.0 is hardly up to par with even those found in Samsung's high-end phones last year, though it does have a fast f/1.9 aperture and the same camera interface when you power it up. It also offers electronic video stabilization when shooting in 1080p, but if you turn off the extra features it's capable of 1440p video capture. Images are pretty good, at least for a tablet, but won't be rivaling shots from last year's flagship or even some mid-range phones. Dynamic range isn't too great, and while the camera is quick to capture shots I wasn't blown away by the results. It was useful for snapping pictures of things around the house, and getting the occasional shot when I was out-and-about, but it's worth remembering that the phone you certainly have on you anyway will probably offer a better experience. The front-facing camera is just a 2.1MP unit, but by default is set to 1.6MP to fill the 4:3 screen. It's quite bad, actually, and will really only suffice for video Hangouts and really shouldn't be considered for selfies (for numerous reasons). I know there are serious thickness and depth considerations when putting a front-facing camera in a tablet, but I'd much rather have opted for having no rear camera at all on the Tab S2 8.0 to simply get a better shooter on the front for video calls. One feature that's carried over nicely from the modern Samsung phones is the one-touch fingerprint sensor in the home button, which is backed up by the same software experience for recognizing and using those prints in apps. You can use the fingerprint sensor to unlock the tablet of course, as well as protect content in certain apps and unlock third-party apps that have integrated with Samsung's fingerprint APIs. It works well, just like it does on the Galaxy Note 5, but I don't find a fingerprint sensor to be such a "must have" on a usually home-bound tablet as I do on a phone. In the end it adds more cost to a tablet that's quite spendy already, and as I noted earlier it's just another reason to keep the less-than-optimal hardware navigation keys on the bezel of the tablet. 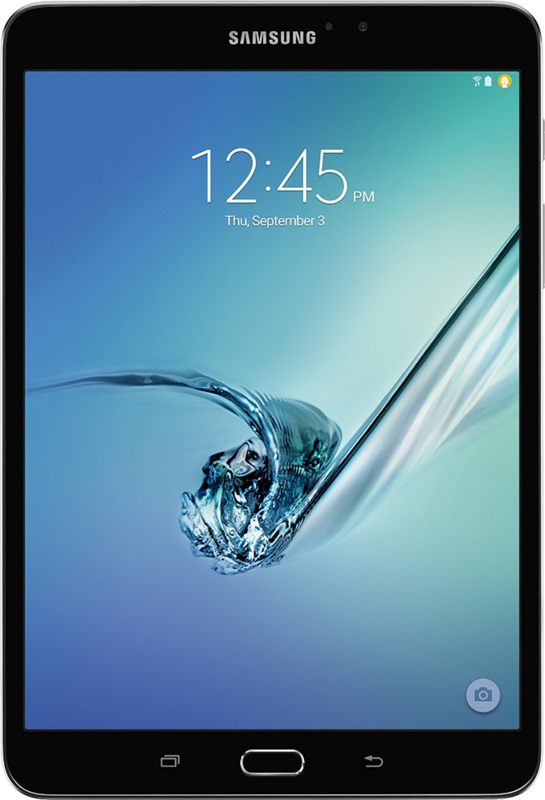 Samsung has done an admirable job with the Tab S2 8.0, hitting tons of big selling points for mid-sized tablets. It has a great screen for all kinds of tasks, is amazingly thin and light, and has really solid performance and battery life. The Tab S2 8.0 even has one advantage over non-Samsung tablets in that it has a robust number of developers that integrate with its Multi Window software. But for all of those upsides, Samsung still stumbles a bit in a few key areas. For a tablet that's likely to be used for media playback, it doesn't lend itself well to landscape viewing with its static hardware navigation buttons, and the speakers are both week and positioned poorly for landscape viewing as well. And though Samsung's software customizations are familiar for those with its phones, aside from Multi Window I don't find much of its design very pleasing to the eye. Including a capable 8MP camera is a nice-to-have feature, but it's not likely to be better than the phone in your pocket, and simply adds to the cost of the tablet — meanwhile the front-facing camera, which you're more likely to use, isn't very good at all. Those downsides wouldn't normally be deal-killers considering how many great specs and features there are to be had on the Tab S2 8.0, but Samsung has put a price tag on the tablet that makes you a bit less willing to deal with compromises. There's no doubt that this tablet offers a great overall experience, and ticks many boxes of what people are looking for in an 8-inch device, but at this price the market is severely diminished. The real question about the Galaxy Tab S2 8.0 is not whether it's a good tablet, but rather how good it is to justify its relatively high price. For an 8-inch tablet that most people won't be using as much as a phone, a $399 MSRP (or $499 with LTE) is a pretty high ask. That's double the price of something like an NVIDIA Shield Tablet K1, and the exact same price as Apple's iPad Mini 4 ... do I think it's twice as good as the Shield Tablet K1? Not really. Does the average consumer value Samsung's experience over Apple's at the same price? That's quite debatable. Of course there are some out there for whom $399 isn't too much to ask for a mid-size tablet, and the only question is "what's the best?" — well, the Tab S2 8.0 definitely offers a good experience, there's no getting around that. At the same time, if you plan to use this highly-portable and powerful tablet constantly, carry it with you every day, and really get the most for your money, you may be able to convince yourself that $399 for an Android tablet nowadays is an acceptable price. When money is no object, it's one to look at. For the rest of us who are on a budget, it's a tough sell. If you've decided that the Galaxy Tab S2 8.0 is the one for you, you can buy one from any of these links below. At the time of publishing several retailers are offering the Tab S2 8.0 on sale for about $349 — perhaps that can sway your decision.